Previous days this week have dealt with issues such as co-operation and stakeholder management. This theme continued on Wednesday as the participants got stuck into the topic of negotiations which is an important aspect of co-operation and is a skill required throughout life and also for their ESD innovation projects. After a review of the previous days work on stakeholders, the topic was introduced by Birgit who created a mind map of negotiation situations in the context of ESD as well as the challenges individuals may face when negotiating. Again facilitator Fabian Busch was on hand to provide a definition of the term negotiation to the group. The trainers used an interactive teaching method to introduce the issue of negotiation styles. Here the participants were required to think about what style they use and to place red dots on a graph to measure on average how the group negotiates and this then led to a discussion. The different styles include defeat, compromise, collaborate, withdraw and accommodate and only one participant had placed there dot closer to the defeat end of the graph. 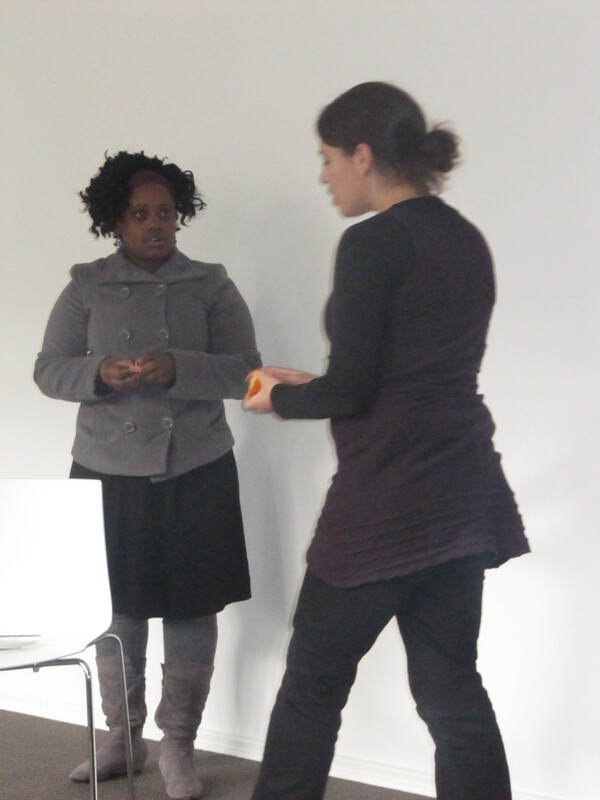 Another teaching method was utilized after the lunch break where a short play was acted out by Lethabo and Mareika. In this the two argued and negotiated over an orange and this performance was then used to spark debate amongst the group. The group discussed how in talking about their interests in the orange, the pair could have resolved the situation and this led to the issue of fighting over positions being introduced. This was then linked to the Harvard approach to negotiations which teaches individuals to separate people from the problem and to focus on interests as well as other criteria. A presentation was given on the Harvard model and once the participants had got a grasp of what it consisted of, a group task was set up. In this task participants were split into two teams in separate rooms. They were given a scenario on the topic of an employee wanting a salary rise and one group formed the role of the HR and the other Junior product managers. They then needed to prepare for a role play in which they would come together and conduct one on one meetings to discuss the issue and negotiate terms. After this was done they discussed the feelings surrounding the discussion, the strategies used and the result of the negotiations and what they received from the discussion. Dieser Beitrag wurde unter 2011 | ESD LT, English abgelegt und mit Sustainable Development verschlagwortet. Setze ein Lesezeichen auf den Permalink.